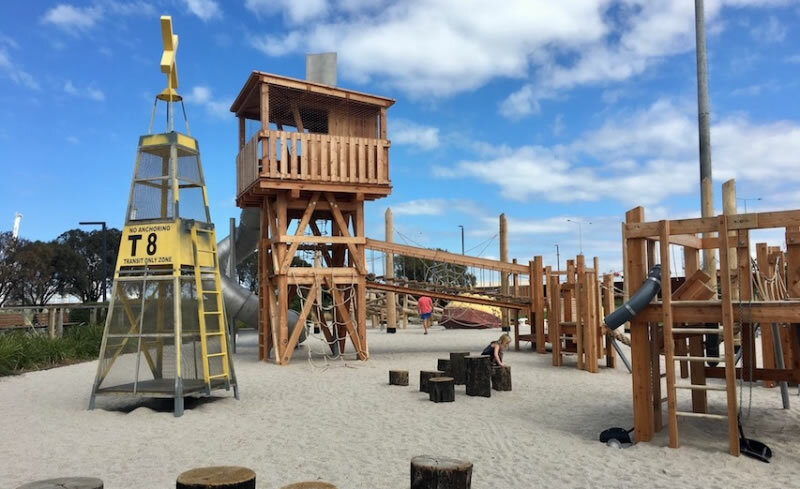 Melbourne's newest waterside park and playground destination for the 'young and the young at heart' has opened to the community on the foreshore at Port Melbourne. The park was officially opened by the Minister for Ports Luke Donnellan on 20 February 2017. Known as Maritime Cove Community Park, the new park overlooking Sandridge Beach at Perc White Reserve, continues the Port of Melbourne's commitment to create more attractive public open space as part of the $1.6 billion redevelopment of neighbouring Webb Dock into an international container port and automotive hub. Working in conjunction with the community, the Port has designed the park to be a welcoming and family-friendly destination complete with a range of attractions to showcase the area's maritime and waterside heritage, mindful of the natural landscape including the foreshore dunes. 'The port undertook lengthy consultation to come up with ideas for the park - including asking local primary school students - and a landscape architect was appointed and refinements were made to ensure this new open space can be enjoyed by everyone,' said Port of Melbourne CEO Brendan Bourke. 'The coming together of the community has made this park a reality,' Mr Bourke said. Maritime Cove Community Park features a variety of maritime-themed and interactive elements. There is a life-saving tower - which is the centre-piece of the play space - and salvaged maritime assets including buoys, a crows nest, channel markers and bollards for children to climb and explore. Sea-animal sculptures and open stage areas resembling shipping containers suitable for picnics enhance the maritime theme. Other features include climbing walls, ladder bridges, water features and a dedicated young children's play area. Maritime Cove Community Park complements other improvements already delivered along land abutting the port as part of the Webb Dock redevelopment. The open space area incorporating Perc White Reserve now features exercise stations, extra lighting, drinking fountains, new seating, garden beds, beach showers and additional car parking. New raised timber boardwalks link to the beach while a shared cycling and walking trail leads to an observation platform providing an unobstructed vantage point overlooking the Melbourne city skyline. Other fully-landscaped walking and cycling trails also link the foreshore to nearby Westgate Park under the West Gate Bridge and the Yarra River. 'The community has been quick to embrace these improvements which are integral to the Port's commitment to protect and enhance amenity for residents, workers and visitors to the area,' said Mr Bourke. 'We have spent a lot of time listening to the community to make this transformation. This community park together with the other public use improvements will remain a positive legacy of the Webb Dock redevelopment for years to come,' Mr Bourke said. The Maritime Cove Community Park design was informed through a collaborative and on-going consultation program involving a dedicated stakeholder liaison group, Port Phillip Council, Life Saving Victoria as well as focus groups comprising residents and local primary school students and children. A contract for the detailed design and construction of the project was awarded to Baron Forge Contractors Pty Ltd who was involved in the Royal Park interactive play area next to the Royal Children's Hospital. Melbourne firm Oculus undertook the landscape architecture. The Port in particular would like to acknowledge members of Port People Inc for their contributions towards the park project, as well as members of the park's stakeholder liaison group, City of Port Phillip, Life Saving Victoria, Port Melbourne Primary School and Lady Forster Kindergarten.